Cameron Riley Fabritz, 19, earned his angel wings on Monday, November 27,2017 after a brief battle with pneumonia, complicated by ongoing treatment for Leukemia. Visitation will be held Thursday, November 30, 2017 from 5-7 p.m. at Ernst Funeral Home in Waukee and a Celebration of Life will be held Friday, December 1, 2017 at 10 a.m. at the Lutheran Church of Hope in Waukee. Following the burial, a luncheon will be held back at the church. In lieu of flowers, memorials suggested to: Children's Cancer Connection or Blank Children's Hospital Child Life Services. Cameron was born on October 24, 1998 in Des Moines, Iowa. He graduated from Waukee High School in 2017. He was a giant teddy bear who truly cared about the people in his life, especially his three younger siblings and one furry buddy named Gus. Cameron also enjoyed video games, YouTube and binge watching new-to-him TV shows, most recently Friends. 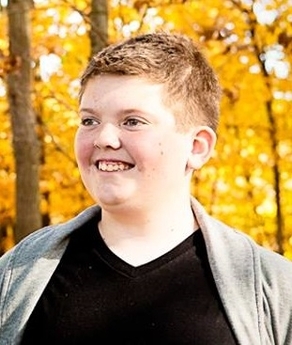 For the past 22 months, Cameron has been undergoing treatment for Leukemia. While most kids his age were enjoying some the best years of their life, he was sitting in a hospital room trying to make the most of the hand that was dealt to him. Throughout his battles, Cameron was an example of strength, courage and kindness.